To make basic onion ring batter, add the flour, salt, egg yolks, and oil to a bowl and beat the mixture with an electric mixer until it's smooth. Next, gradually add the milk and continue beating until it's thoroughly combined. Then, cover the batter and put it in the fridge for 30 minutes. After half an hour, whisk the egg white until it's stiff and fold it into the chilled batter�... I have finally found the secret for getting onion ring batter to stay on the durn onions while cooking. Simply put the sliced onions in a ziplock baggie and let them sit in cornstarch for an hour or so before cooking! Works every time. Deep-frying, as opposed to baking is the way I like to cook my onion rings. When fried correctly, the coat of your onion ring batter will seal beautifully without breakage, and not allow for any excess oil to seep in. Drop a bit of batter to test if the oil is hot enough, use wooden chopsticks, or just drop a corn kernel into the oil and it�ll pop when it�s hot enough. Follow the no... Dust onion rings with rice flour, coat in batter and, in batches, carefully lower into the oil so the batter puffs up before the ring has a chance to sink. Deep-fry until light golden brown and crisp (1-2 minutes; be careful, hot oil may spit), then season with salt and serve. I have finally found the secret for getting onion ring batter to stay on the durn onions while cooking. Simply put the sliced onions in a ziplock baggie and let them sit in cornstarch for an hour or so before cooking! Works every time.... Dip chicken or onion rings in batter. Fry in deep fat heated to 365�F. Cook meaty pieces first for 15 minutes. Fry backs and wings about 13 minutes. Drain on paper towels. Fry in deep fat heated to 365�F. Place the coated onion rings on a non-stick baking sheet in a single layer. Repeat for the rest of the onion rings. Repeat for the rest of the onion rings. Spray the coated onion rings with cooking spray. How to Make Fried Onion Rings. For Maida Batter: 1. Take a deep bowl and add maida along with salt, baking powder, garlic powder, black pepper powder and oregano. 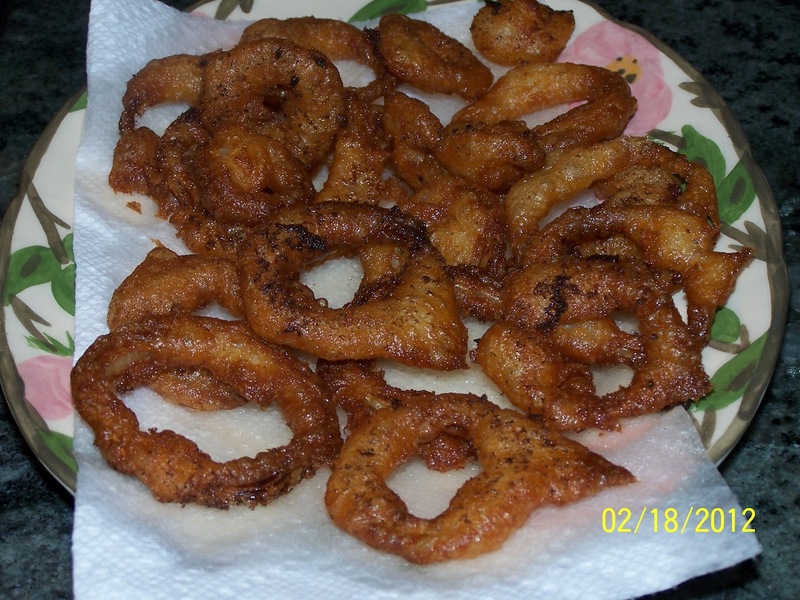 Dust onion rings with rice flour, coat in batter and, in batches, carefully lower into the oil so the batter puffs up before the ring has a chance to sink. Deep-fry until light golden brown and crisp (1-2 minutes; be careful, hot oil may spit), then season with salt and serve.